A recent Reuters report puts it well. 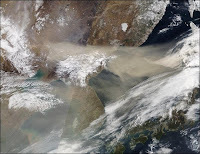 "Dry weather and seasonal winds in China hurl millions of tonnes of sand at the Korean peninsula and Japan from late February through April or May, turning the skies to a jaundiced hue." The state-run Korea Environment Institute says the economic damage resulting from the haze, which occurred 11 days last year, amounts to 5.5 trillion won ($5.82 billion). ``The seasonal winds decrease productivity and increase product defect rates in some of the country's leading sectors,'' said Park Young-woo, the president of the Business Institute of Sustainable Development (BISD), a local group that promotes corporate sustainability. Hynix Semiconductor, the world's second-biggest memory chipmaker, says it operates an around-the-clock yellow dust alert system to inform employees of when dust levels go up. It has had to step up its filtration systems and make employees take longer air showers to make sure the dust does not contaminate its production lines and damage chips, made using technology that operates on a microscopic level. The sand over Korea can be seen quite clearly in the above photo from NASA. Click on the photo to enlarge it.